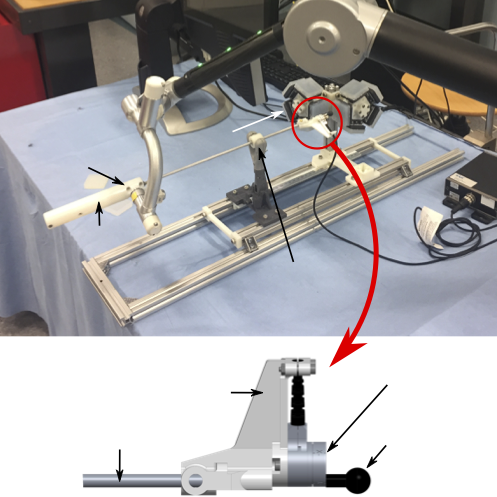 The project consists of augmenting the surgical cockpit to facilitate the execution of gestures during robotic laparoscopic surgery. This includes the design, implementation and evaluation of multimodal interaction techniques at the cross-road between HCI and Robotics. An example of this could be 1) devices which will be manipulated by both the user and a robot to increase the robustness of the interaction or 2) devices using non-standard body parts such as the head or the feet. Read more on the ISIR project website and the CAMI Labex website. Impacts of Telemanipulation in Robotic Assisted Surgery. Ignacio Avellino, Gilles Bailly, Geoffroy Canlorbe, Jérémie Belghiti, Guillaume Morel and Marie-Aude Vitrani. To appear: Proc. ACM CHI 2019. 12 + 3 pages. 23.8% acceptance rate (705/2958). Using Comanipulation with Active Force Feedback to Undistort Stiffness Perception in Laparoscopy. François Schmitt, Josue Sulub, Ignacio Avellino, Jimmy Da Silva, Laurent Barbé, Olivier Piccin, Bernard Bayle, and Guillaume Morel. To appear: Proc. IEEE ICRA 2019. 6 pages. 40% to 45% acceptance rate. Événements Indésirables de la Chirurgie Robot-Assisté. Workshop Le robot chirurgical : Quelles approches interprofessionnelles techniques et non techniques ? 2018. 4 pages.